For those of us who would rather stay warm in our cars when we get home, we have an excellent garage door opener that will open the door for you so you can drive right into the garage! There's no need to get out of the car and fiddle with the door to open it, our automated garage door system and garage door opener will do all the hard work for you. AZIMUT is an Electromechanical irreversible motor for sectional and spring balanced doors up to 2.25m in height and counterweight balanced doors up to 2.45m in height. Max. 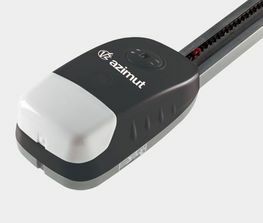 area ( 8 m²) Maximum force 500 N (50 kg).The kit contains:- 1 x AZIMUT Electromechanical actuator, 2 x Phoenix 433.92 MHz two-channel transmitters, 1 x One piece chain guide (Length = 3 m).